Olympic Day was introduced in 1948 to commemorate the birth of the modern Olympic Games on 23 June 1894 at the Sorbonne in Paris. The goal was to promote participation in sport across the globe regardless of age, gender or athletic ability. Olympic Day is much more than just a sports event, it is a day for the world to get active, learn about Olympic values and discover new sports. 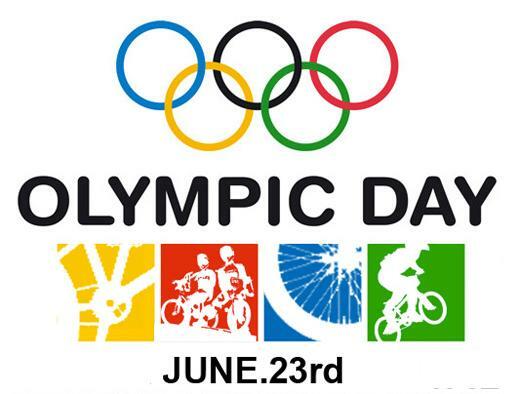 Over the last 20 years Olympic Day has been associated with Olympic Day Runs all over the world. From 45 participating National Olympic Committees (NOCs) in the first edition in 1987, the numbers have grown to nearly 200 participating NOCs.. Olympic Day Run is an international Olympic Movement activity promoting mass participation of sports held in June organized by National Olympic Committees (NOCs). Olympic Day is nowadays developing into much more than just a sports event. Based on the three pillars “move”, “learn” and “discover”, National Olympic Committees are deploying sports, cultural and educational activities. Based on the three pillars move, learn and discover, National Olympic Committees are organising sports, cultural and educational activities throughout the world. Some countries have incorporated the event into the school curriculum and, in recent years, many NOCs have added concerts and exhibitions to the celebration. Due to World War II, Olympic Games had not been held in either 1940 or 1944. Olympic Day was held for the first time on 23 June with a total of 9 National Olympic Committees (NOCs) hosting ceremonies in their respective countries: Austria, Belgium, Canada, Great Britain, Greece, Portugal, Switzerland, Uruguay and Venezuela. In 1987, in an effort to encourage all NOCs to commemorate and celebrate Olympic Day, the IOC Sport for All Commission launched the Olympic Day Run concept with the objective of promoting the practice of participation in sport by men, women and children from all corners of the world and all walks of life, regardless of athletic ability. The first Olympic Day Run was held in 1987, over a distance of 10km, with 45 participating NOCs. In 2006, there were 161 NOCs promoting Olympic Day Run to their countrymen. The Olympic Day Run is usually held during June 17–24 by NOCs, with 1.5 km Olympic Day Fun Run, 5 km, and 10 km running activities.